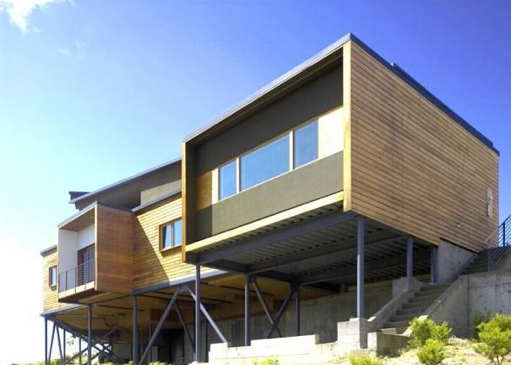 Our Home of the Week sits on Tamalpais Ridge. Imagine living in an ultramodern home with an award-winning design and all the amenities you could imagine, perched on top of a ridge with commanding views of Muir Woods, the Pacific Ocean, and the San Francisco Bay. Your home is waiting for you in Mill Valley — it’s our Home of the Week. Designed by the architect Lorcan O’Hirlihy and winner of a merit award by the American Institute of Architects, the home was built in 2003 on the top of Tamalpais Ridge and blends in with the surrounding countryside while offering unmatched views. Inside are soaring spaces, walls of windows, and a wealth of wood. The stunning master suite has floor-to-ceiling windows and built-in, custom-designed furniture, and the master bath has an outdoor spa. Special features in the home include an Italian kitchen by Poliform, a Pilkington luminous glass wall in the main hall, and an indoor-outdoor fireplace. This extraordinary estate is 10 minutes from downtown Mill Valley and 20 minutes from San Francisco. Expansive windows reveal breathtaking views.